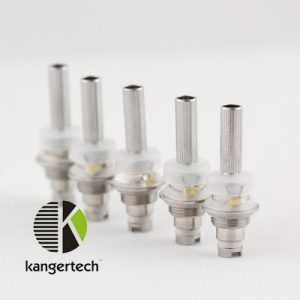 These 2.2 ohm coils by kangertech will have your vape pens/ ecigs feeling like new again! 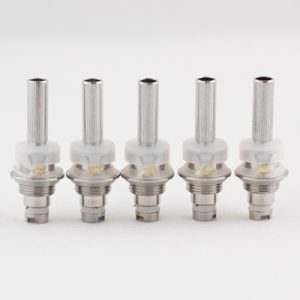 These genuine KangerTech atomizer/clearomizer coils come in packs of 5 (price is for all five) can be used with a variety of different clearomizers. 2.2 ohms: We offer two levels of resistance, 1.8 and 2.2 ohm kangertech replacement coils. The 2.2 ohm coils are great coils for your all around choice for a variety of vape devices and types of ejuices. 1.8 ohms: 1.8 Ohm Kanger coils should be used on a lower voltage device/ setting because of the lower resistance, so if you have a variable voltage, use a lower voltage settings with a 1.8. In terms of voltage, you should have a vape pen device with/or set between 3.1-3.4 volts with a 1.8 ohm coil. You should have between 3.5-3.8 volts with a 2.2 ohm coil. What type of Vape Pen Do You Have? Most standard eGo batteries (non-variable voltage like the ego-t) will have a set voltage of 3.6-3.7 volts. If you have an ego c twist that has variable voltage, you can change the settings to the voltage of your choice, so you are free to choose any level of resistance (ohm) coil you want. If you have an ego c twist, you can get either the 1.8 or 2.2 coil, however if you have a standard evod or ego without variable voltage functionality, you should choose the 2.2 ohm heads like this one. 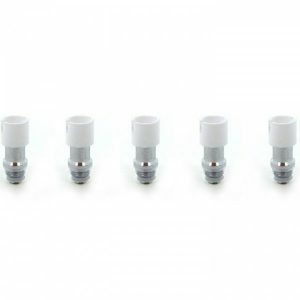 Low Resistance: Some people who prefer a warmer vape may choose a low resistance atomizer like the 1.8 ohm atty heads.